Our first BUILDx event of the year was titled “Inspiring an International Audience.” We welcomed three speakers, Dana Farraj from Right2Education, Salem Barahmeh from PIPD, and Diala Isid from Right to Movement to talk to us about their experience in addressing and inspiring international audiences. The panel discussion started with a brief introduction from each of our speakers. They each talked about the work they do, and their involvement with international audiences. “To reach hearts and minds all over the world, you need to start with the basic common denominator of humanity.” Salem shared that engaging with the world has been part of Palestinian national strategy since 1948, and that since then, we have tried to internationalize our struggle. When you talk about basic human concepts like freedom, justice, and human rights, it’s difficult not to inspire. Diala shared an example of a campaign they ran, where “11 Marys and 11 Josephs” attempted to run from Nazareth to Bethlehem, to lay baby Jesus. They attempted to answer the question: What if this were to happen today, under occupation? Would Mary and Joseph have made it with all the roadblocks, checkpoints, and restrictions to movement? AJ+ covered their effort, and the campaign went viral. Diala says that running is a universal act, and using it as a means to capture and inspire audiences has truly been successful in their case. For Salem, this is less of a challenge as PIPD is focused on telling Palestinian stories. So the work of the organization in its core is involving of the local audience. 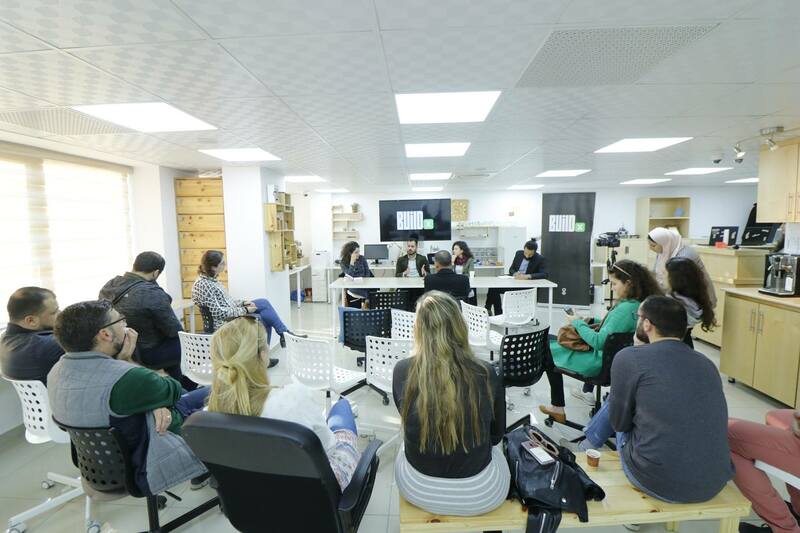 PIPD runs local campaigns to collect stories, photos, videos, of Palestinians to share. They include local audiences in the process. Doing so, they overcome the above challenge. Dana agreed with both Diala and Salem by saying that by collecting and sharing students’ stories, they feel like they contributed with their voice. According to Salem, for any entrepreneur, disruption is the best tool. For PIPD, the best tool to reach audiences proved to be digital, especially with their target reach. Since they started, over 80 million people saw their stories. Right2Education is a campaign run by Birzeit University which aims to highlight the basic human right: the right to education. It also aims to underscore violations of this right, as well as the right to movement, due to Israeli occupation. The Right2Education campaign works on meeting different delegations coming into university, and talking to them about their work. Right2Education works on a local level by sourcing student volunteers, and addresses the international audience with their help. Palestine Institute for Public Diplomacy (PIPD) is a platform which aims to share stories of Palestine and Palestinians with the world, and to develop “Palestinian public diplomacy capabilities at home.” PIPD works to narrate the human side of Palestinians and to present a more humanized version of the Palestinian struggle for freedom, human rights, to audiences across the world. Right to Movement focuses on the basic human right: the right to movement. They do so by underlining the restrictions of movement, and aiming to change those through sports. Their slogan is “We run to tell a story,” a positive one about Palestine. The movement started with one group in Bethlehem and now has 9 communities all over Palestine as well as internationally in Copenhagen, Ghana, Amman, America, UK. They succeeded in mobilizing supporters for Palestine, and create runner communities across the globe.